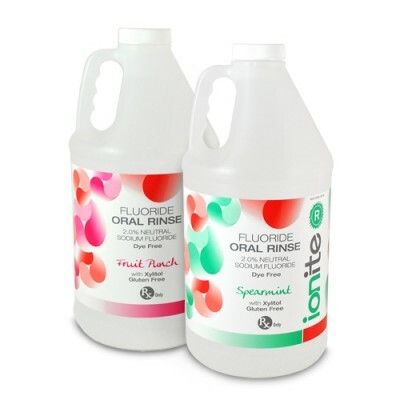 • Ionite-R Neutral Fluoride Rinse is ideal for patients with cosmetic restorations or intolerance to acidic fluoride. • It provides the perfect non-acidic balance allowing patients to tolerate and accept fluoride treatments with comfort. • It is dye-free which makes it perfect for patients with allergies to dyes and for patients who have undergone whitening procedures. • Contains Xylitol which is an ideal ingredient for caries prevention. • Contains: 2% Sodium Fluoride (0.90% Fluoride Ion). • It is easy to use and a cost effective alternative to fluoride trays. • Effective and dependable performance with a 2-minute application time.